I love, love, love reading this book aloud. Cynthia DeFelice is an incomparable story teller!! Mr. and Mrs. O'Grady are poor. Then Mr. O'Grady finds a magic pot that duplicates whatever lands in it. Once the premise is established the kids immediately "tumble" to the predicament when Mrs. O'Grady falls into the pot by accident. Andrea U'Ren's comic illustrations perfectly complement this folktale. The image of Mrs. O'Grady's legs sticking out of the pot is the "money" page. I just let the kids savor the picture then wait for the "oh NOs" to start through the audience. I can't believe I get paid to have fun like that!! Labels: book awards, Texas Bluebonnet Award, Texas Library Assn. 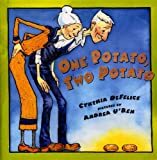 I have heard Cynthia speak at a couple of children's literature conferences. She is a good storyteller indeed! I love ONE POTATO, TWO POTATO. I also love her book COLD FEET, which was illustrated by Robert Andrew Parker. It's great for reading at Halloween! Reading aloud to children is the thing that I miss most in retirement.